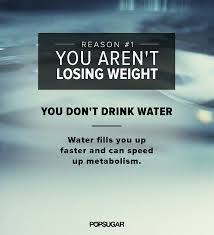 Water helps in weight loss by more ways than one! So you want to learn about the best way to lose weight. You obviously know that you need to do some lifting and cardio regimens to achieve this. However just heading to the gym and working out is not enough. You also need to make some lifestyle changes for good to ensure the fat stays away for good! There is no program offering the best way to lose weight as once the program ends, most people return to their previous food and lifestyle habits. If you really want to lose weight, and keep it off, you have to be dedicated about it. You have to make lifestyle changes which you will be able to follow and live with indefinitely. This doesn’t imply that you have to over-restrict your calorie consumption; you need to learn how to eat healthy and follow an exercise program which adequately changes you in various manners so that you can maintain your ideal weight for years to come. It’s important that you drink as much, or rather more water than usual. This is because most cellular activities take place in water, including the transportation and burning of fat. Moreover, if you drink more of calorie-free water, you tend to feel fuller and thus end up eating less. Ideally, you need to drink at least an ounce of water for 2 pounds of your bodyweight. So if you weigh 250 pound, you need to drink at least 125 ounces of water. The best way to lose weight is by making it a habit to eat a full, balanced breakfast. Your body has starved all night and needs sufficient food and nutrients to rebuild itself. There’s no point of just catching something quick on the run instead of a full meal. It only gives a negative impact to your workout and whatever you do throughout the day. A typical, full balanced breakfast to start your day is one with sufficient protein of about 30-40 grams, a complex carbohydrate like oatmeal and some fruit. Another lifestyle change you need to implement is to limit your consumption of sugar. While consuming simple carbs or sugars immediately after weight training helps replenish muscle and liver glycogen stores, too much of sugar consumed at other times gets stored as fat. So if you have a sweet tooth, it’s imperative that you satisfy your craving occasionally. It’s in fact better if you limit your sugar intake to only fresh fruit and make it a habit of replacing sugary beverages like soft drinks and juice with tea, coffee, water or diet soda. Last but not least, another best way to lose weight is by reducing your consumption of starchy carbs. Too much of starchy foods like potatoes, pasta, breads and rice gives your body excess energy and glycogen. So anything which is not burnt or used eventually gets stored in the body as fat. This does not mean you need to completely eliminate starchy carbs from your diet. However you need to reduce its consumption if you want to lose body fat. It’s preferable if you limit your total starch consumption to 3-5 servings in a day where one serving is a cup of pasta, sliced potatoes or rice. With these 5 lifestyle changes, you will not only find the best way to lose weight and also how to lose fat for good!